Quilting is one of my passions. I love the feel of fabric, the building of designs (pieced, appliqued, and quilt stitching) and love the warm feeling they add to a home. My quilts are an extension of a heartfelt embrace from me. I honestly think it’s in my DNA. I remember spending time at my grandmother’s. She had this really cool basement with a wringer washing machine (I was always afraid she would get her hand caught in it), shelves of home canned goodies, and a beloved Singer treadle sewing machine. On that sewing machine were little pieces of fabric in the process of being sewn into blocks, chain stitched one after the other and gracefully flowing into a pile on the floor. She made quilts with scraps from clothing and remnants from the fabric store or sewing factory nearby. I have one of her quilt tops that is sashed with seersucker!! Been scratching my head about that one for years trying to figure out what to do!! My mother taught me to sew at a very early age on her Singer sewing machine. I was probably around 9 years old. I still have the first 4-H project that I made hanging in the attic. I won first place in the Junior division at the Dress Revue with a simple colorful shift and a matching tote with white fringe on the bottom. Most of my sewing during my youth was clothing and that culminated with designing and constructing my wedding dress. It was after our first daughter was born that the quilting cells in my body began to multiply. I treated myself during her afternoon nap time to “my time.” I purchased a Leisure Arts quilt booklet called “Teach Yourself to Quilt” and that’s what I did. Already knowing how to sew, it was just specific quilting processes and short cuts I was learning. It took a while to make that 9 block quilt sampler and I watched quite a few episodes of “As The World Turns” and “The Guiding Light” as I hand quilted that piece. 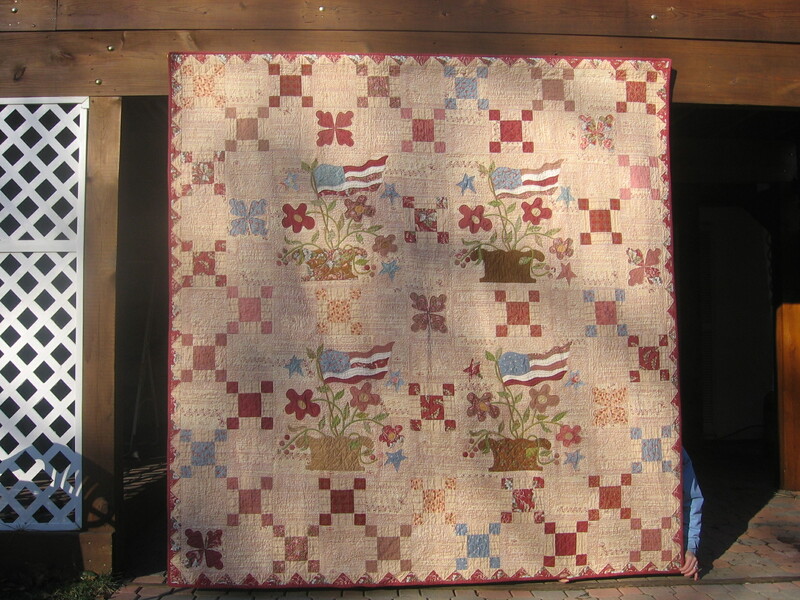 I didn’t enjoy hand quilting at all and it was several years before I made another one. And then we moved to Mecca! My husband’s school assignment sent us to Ft. Leavenworth, Kansas. (By the way, the school was NOT located in the prison!) This area was rich in fabric shops, quilt guilds, and quilting veterans some of whom I think were born with a needle in their hand. The best thing that happened was NOT qualifying for post housing (we didn’t have enough kids) and we rented a house in Lansing. Our across the street neighbor was Maureen and she was a quilting goddess! She was absolutely masterful and I would sit in her sewing room above their garage and just watch her machine quilt for hours! As so it began. Maureen introduced me to mock machine applique techniques and continuous line machine quilting. My life (and those of my family) have not been the same since. That year my goal was to make one quilt a month and I managed to accomplish it. They weren’t all big, some were only tabletoppers or runners with the largest a lap size quilt. 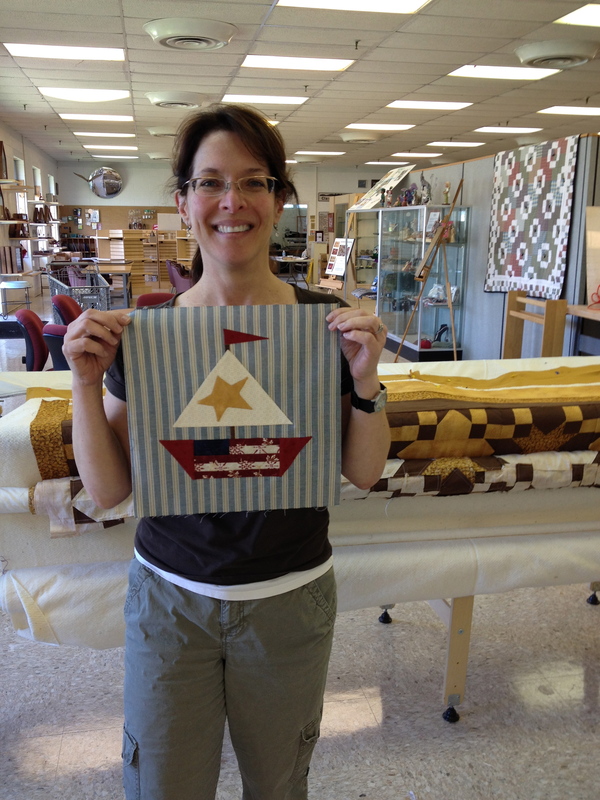 My favorite store was the Liberty Quilt Shop in historic Liberty, MO…sadly it’s no longer in business. 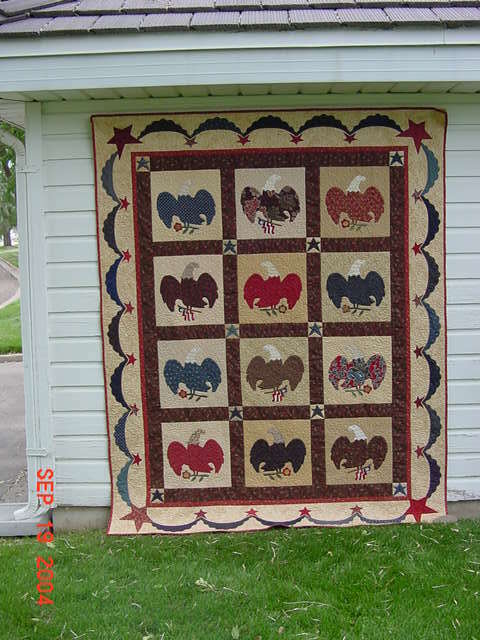 My obsession with quilting was so intense during that year that my husband teased me that I had become part of a cult and that we would have coven meetings. To this day, he refers to my quilting friends and groups as “The Coven. I joined quilt groups and even lead a few of them. I worked at Memere’s Garden, a quilt shop in Leesburg, VA (again, sadly out of business)where I made shop samples and taught quilting classes. 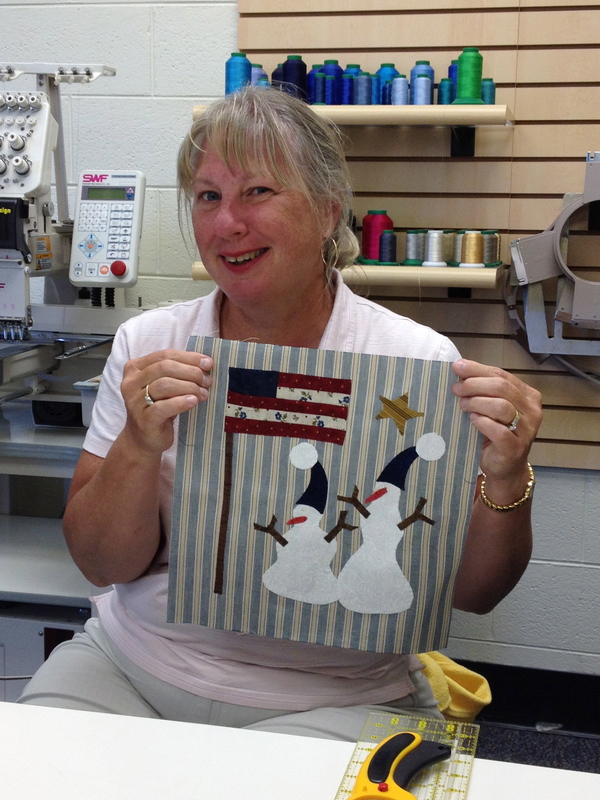 Payment for teaching came in the form as a paycheck…payment for sewing the shop samples came in fabric and supplies. So instead of financially supporting my “habit”, it merely fed my obsession. Enough chatter…time to show you some photos. The first few are charity quilts I have made over the years and given to organizations for fund-raising. 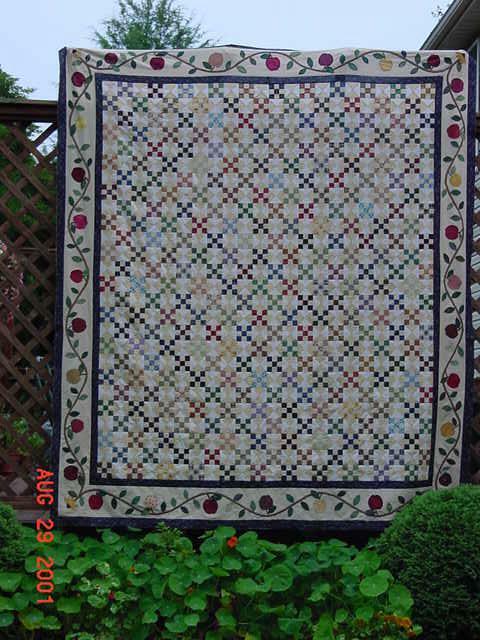 My first charity quilt was the brain child of my father, celebrating the 25th Anniversary of the Ivy Hill Farm Festival. It was raffled and all the proceeds went to our hometown’s food bank. 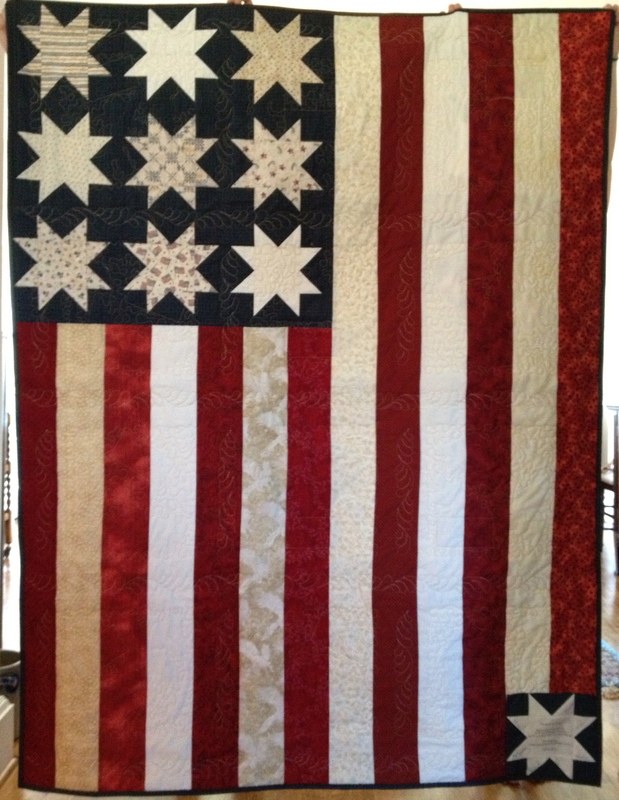 This quilt has a special meaning to me…I put the finishing stitches in this quilt as I watched on television the despicable act of terrorism on our country on September 11, 2001. 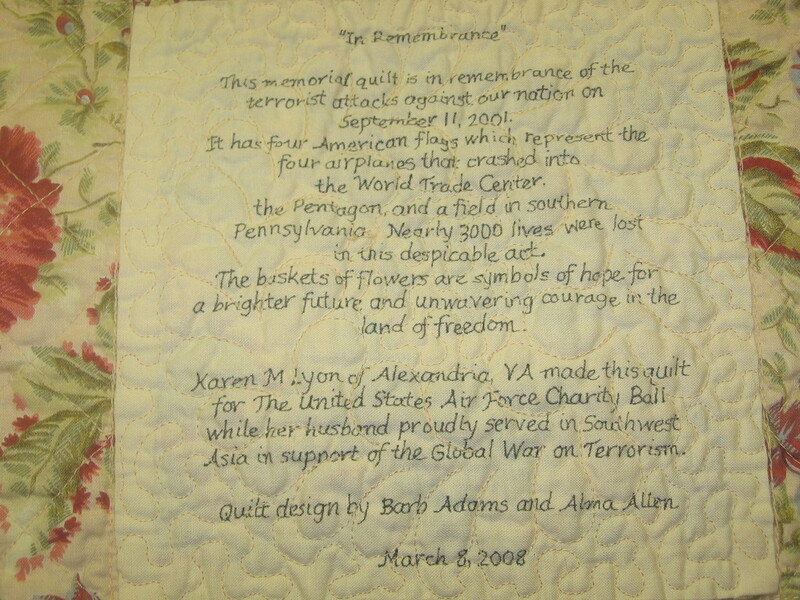 Every charity quilt I have made since then has been dedicated to the innocent lives lost on that day. 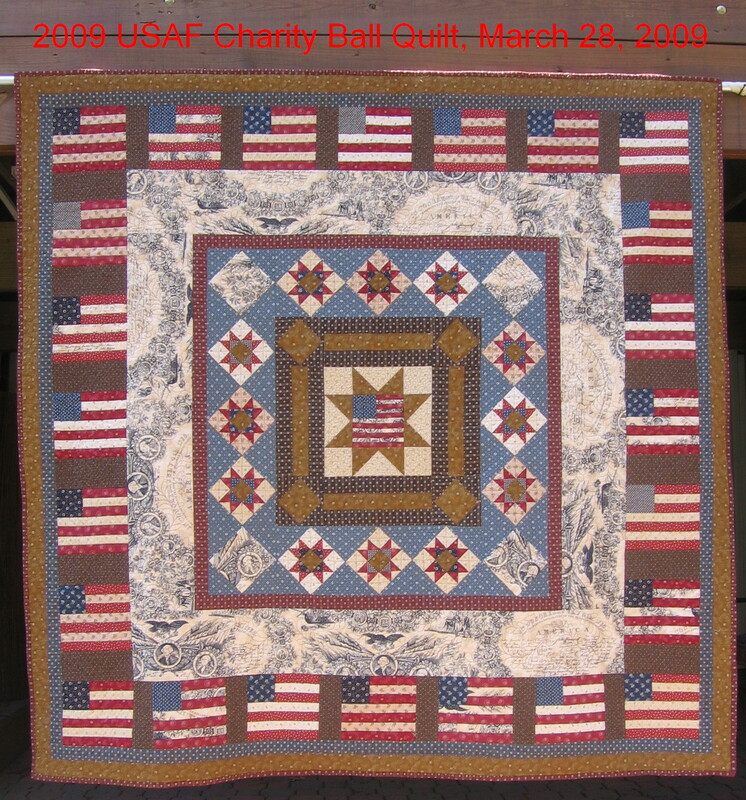 This is the charity quilt from 2003…proceeds went to the 388th Fighter Wing, Layton, Utah. 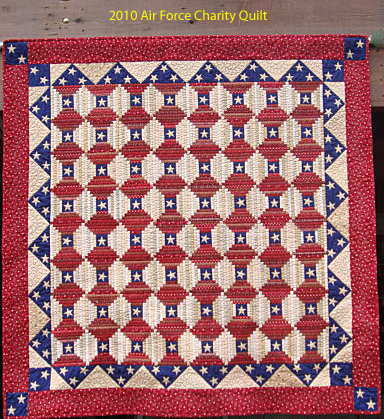 2004 charity quilt, “American Spirit,” front and back signature block, proceeds benefiting the 388th Fighter Wing, Layton, Utah. 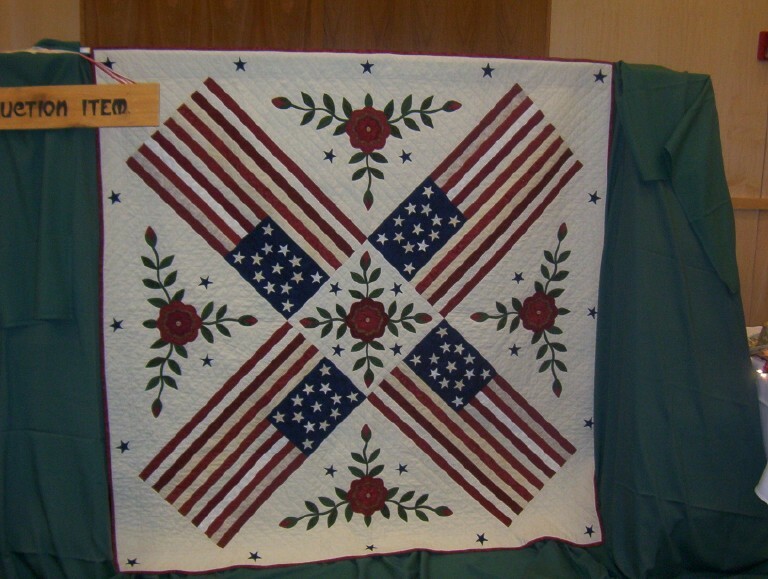 2008 charity quilt, “In Remembrance,” proceeds benefited the Air Force Aid Society. donated to the USAF Charity Ball with proceeds for the Air Force Aid Society. 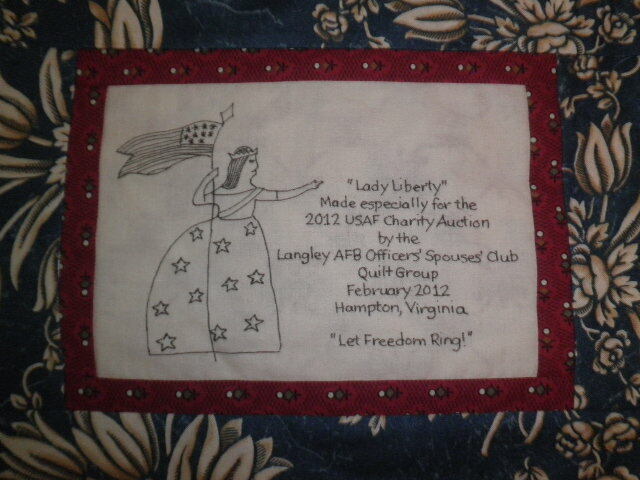 2012 USAF Charity Quilt, “Lady Liberty,” auctioned on March 24, 2012. 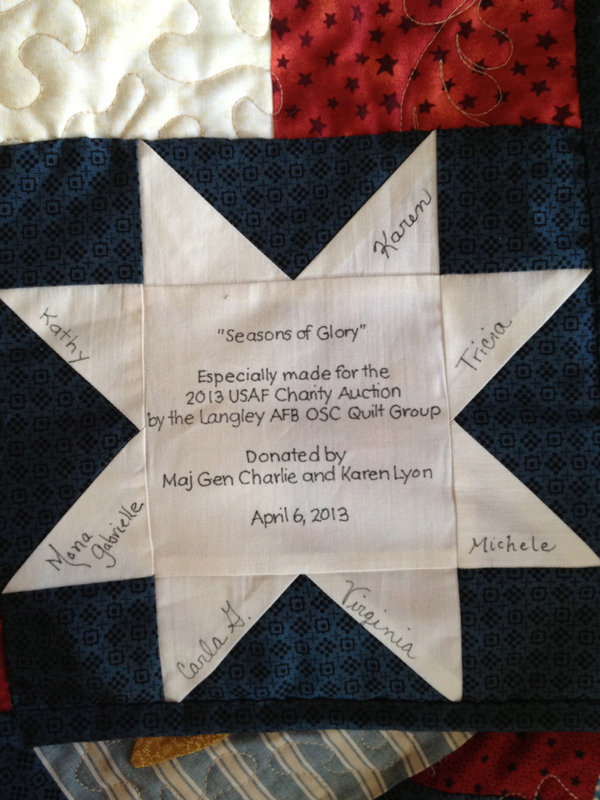 Many thanks go to the members of the Langley Officer’s Spouse’s Club quilt group who helped me complete this quilt. 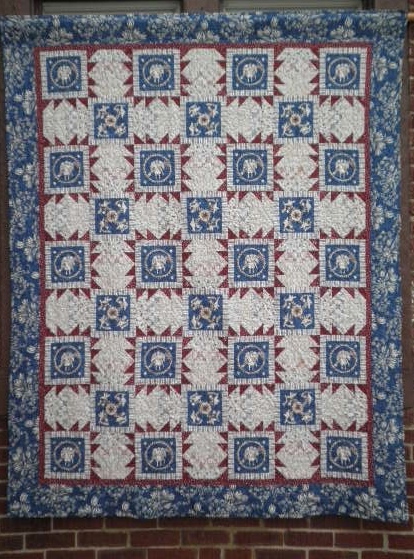 I had half of it pieced, our group finished it in 2 sessions and Mona machine quilted on her long arm machine!! A true team effort!! Thank You!! The quilt design and fabrics were by Bonnie Sullivan and Moda Fabrics. 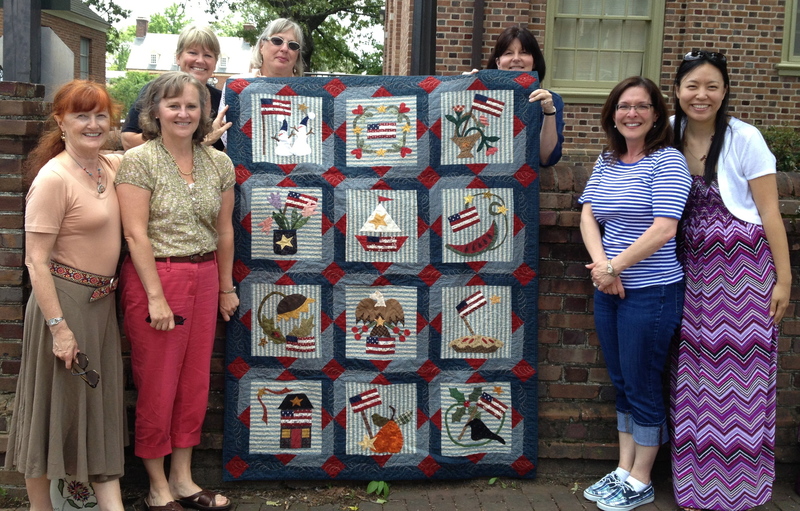 These lovely ladies contributed to the construction of this quilt. The back of the quilt is equally as beautiful and used a lot of scraps from our fabric stashes! The generosity of these women is overwhelming!